Residents from Black Mesa/Big Mountain will head to Window Rock for the Navajo Nation Tribal Council’s meeting and possible vote on the Navajo-Hopi Little Colorado Settlement Agreement this Friday, June, 22nd. Although the Hopi and Navajo Tribal councils vetoed Senate Bill 2109, a significant decision on the Settlement, which concerns aboriginal claims to land and resources, could be made within the week. Since 1974, Peabody Energy and the U.S government have made grand promises to the people of Black Mesa/Big Mountain in order to access the second largest deposit of coal in North America. Equally desirable were the aquifers and rivers used to provide water to desert cities and to slurry coal from Black Mesa to generating stations. Activists express deep concern over the parts of the Water Settlement that require the Navajo Nation to renew its lease with NGS until 2044 and the clauses that prohibit any lawsuits against the parties that have caused past or will cause future damage. 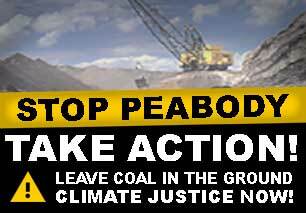 The renewal of NGS’s lease would effectively keep Peabody’s mining operation functional during that time. Through corporate and political maneuvering and the fabrication of a land dispute, PL 93-531, the Relocation Law, divided the former Joint Use Area (JUA) of the Hopi and Navajo lands into the Hopi Partitioned Lands (HPL) and Navajo Partitioned Lands (NPL). The forced relocation of about 14,000 Navajos and about 300 Hopis was a part of the process through which Peabody Energy accessed surface rights to the HPL, as well as the millions of gallons of water needed to process and slurry coal. PL 93-531 prohibits Dineh residents of the HPL from maintaining springs and wells, building infrastructure like dams, and accessing new water sources. It has restricted infrastructure development to roads, houses, wells electricity and running water. 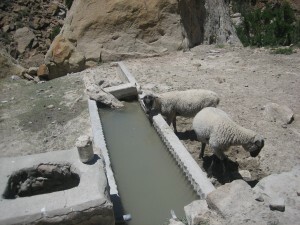 Many Dineh residents of the HPL travel between 40 and 80 miles round-trip on undeveloped roads to get water for themselves and their livestock. Therefore, as springs dry up and the water table drops because of mining water use, drought, and climate change, HPL residents feel the impacts disproportionately. 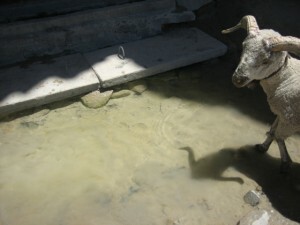 Nicole Horseherder understands this threat that a lack of accessible, clean water poses to traditional lifeways on Black Mesa thusly: “They [traditional elders and residents of Black Mesa/Big Mountain] understand the connection between the environment and their ability to sustain what they’re doing today. If the water cycle is out of balance as it is now, they know the thing that’s going to be affected first and foremost is their livelihood…What we’ve been relying on all these years are free-flowing natural springs, natural seeps and places where … the water will come right out of a break in the face of the rock,” she said to reporter Anne Minard. She added that generations of people have built cisterns to collect spring water, and cleaned out areas around springs so pools can form. Thanks to many generous donations, Black Mesa Indigenous Support (BMIS) is collaborating with the Black Mesa Water Coalition (BMWC) to help get Big Mountain and Black Mesa community members to Window Rock for the vote this Friday, June 22nd. We would like to express our gratitude for the interviews and the opportunity to support this community mobilization. A link to S.2109, the settlement & summaries: http://bit.ly/I8g7pr. Also check out this article that explains and refutes the Kyl’s use of a picture of a horse and wagon on the Navajo Reservation to describe how Navajos aren’t transporting water safely and aren’t “using” it properly. Ironically, the picture he’s referring to is of a resident on the HPL, who described how the horse and wagon actually belong to a local roving vet—a Midwesterner of European descent. *The words “Dineh” and “Navajo” are used interchangeably in this article. *This article uses the geographic terms “Black Mesa” and “Big Mountain” to describe the areas of the Hopi Partitioned Lands that are close to Peabody’s mines where the Dineh relocation resistance communities are most concentrated. *Some of the framing as well as the quote from Jason John and all quotes from Nicole Horseherder in this article were originally published in the Indian Country Today article, “Black Mesa Shouldering the Burden of the Navajo-Hopi Water Project”, by Anne Minard (May 27, 2012). They are reprinted here with permission from the author. 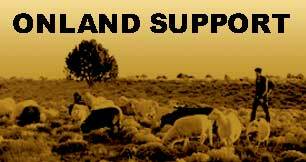 *All other quotes from Black Mesa residents are from personal interviews with the Black Mesa Indigenous Support collective and are used with the speaker’s permission. Stop Expansion & Desecration of the San Francisco Peaks. 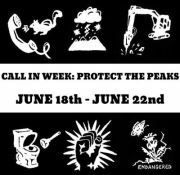 TAKE ACTION: Call-In! Cause we ain’t gonna Give-in! (Below is a short/simple guide to help you get started. Please feel free to state those facts/points that you feel are most important to you. If you would like more talking points, please visit www.ProtectThePeaks.org)Hello, my name is ___________ and I am a resident of ____________. I am calling to ask that your company immediately halt all construction on the (sacred) San Francisco Peaks and withdraw your contract with Snowbowl. (Company name here) is committing gross Human Rights violations against diverse communities of Flagstaff and surrounding areas. Your participation in the expansion of Snowbowl Ski Resort threatens the very health and safety of our communities, the environment, the homes of endangered species and our water security.To the 13 Indigenous Nations that hold this mountain sacred, you are an accomplice in cultural genocide. To the children who will accidentally eat the snow, you are risking their health and their lives. And to the fragile alpine ecosystem already under duress, you are committing irreparable harm and death.